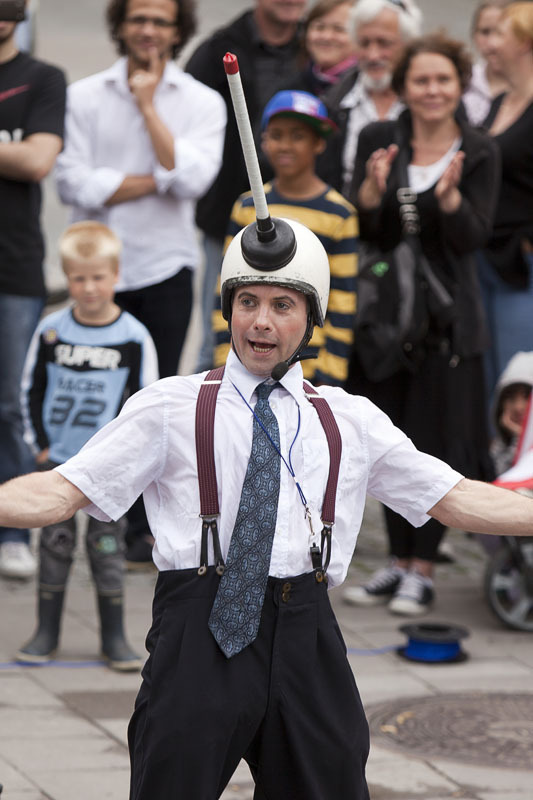 In 2012 Justin McGinley became the instant Audience Favourite Clown at Stockholm Street Festival. So it´s with great pleasure we can announce that Justin returns for the 2015 edition of SSF. Justin recently finished touring with Circus Oz as the feature comedian/clown. Oz’s “30th Birthday Bash” received rave reviews and was largely “Sold Out” throughout Australia, Europe, USA and New Zealand. Prior to Circus Oz, Justin was feature comedian/ clown and juggler for Circus Royale. In 2005-06 Justin wrote, directed and performed Am Dilemma. It first appeared at the Melbourne Fringe Festival in 2005, where it received a Commendation for “Best Comedy”. He then performed at the Melbourne International Comedy Festival 2006 and then toured in the USA and Canada. He received “Best Solo” Show at the London Fringe (Ontario) 2006.Justin recently finished performing “Antics Shop” and “A Curious Day” for the Melbourne Fringe Festival, 2009. “A Curious Day” received runner up for “Best School Holiday Program” show. Justin began as a street performer, working throughout Australia. Within 3 years he was successfully performing at some of the major festivals around the world. These include; Namyangju Open Air Arts Festival (South Korea), Christchurch International Buskers Festival (New Zealand), Festival De Avignon (France), Rotterdam Straatfestival (Netherlands), Kieler Loch (Germany), Taste of Tasmania (Hobart) and many more. Justin has also been working cabaret and comedy clubs throughout Australia and has featured in clubs in New Zealand and the Netherlands. Justin has performed in nearly every comedy and cabaret room in Melbourne and founded the “Floating Hat Cabaret” at Dante’s. He was Semi Finalist in “JJJ Raw Comedy” two years running and Finalist in “Search for a Funnybone”. Justin has had numerous TV appearances on Champagne Comedy (Channel 31), Comic Box (featured comedian, Channel 31), was winner of Hamish and Andy’s “Australian Idiot” (Channel 7).